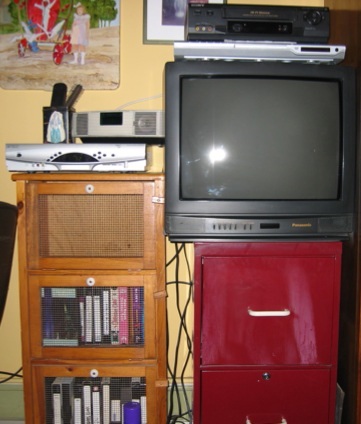 Stacy Horn » Blog Archive » My New HDTV Arrives Tomorrow! My New HDTV Arrives Tomorrow! I think I’m going to be ill. I always feel sick when I spend a significant amount of money on myself. The last time I felt this sick was when I bought myself an upright piano (which I later had to sell). But it should be great, right? I love TV. I watch more than most people think most people should. It gives me pleasure. Why shouldn’t I add to something I enjoy? Why shouldn’t I have a great TV?? Pity the guys who have to carry it up to the top floor of five story walkup, though. Did I mention that it weighs 140 pounds? I will have nice tips ready. Here’s my before shot. Oh man, that file cabinet looks so crappy. Well, I have to save money now. I’ll just paint it or something.